Do the Catskills have any WI6 ice? What do grade 6 ice routes even look like? For a long time I didn’t think I knew what WI 6 ice routes were. I think we northeasterners have been very modest about our grading of hard ice routes. The definition of grade 6 I found on the Alpinist website is “WI6: A full ropelength of near-90 degree ice with no rests, or a shorter pitch even more tenuous than WI 5. Highly technical” A quick perusal of the current Catskill guidebook does a pretty good job of convincing one that there is no WI6 in the Catskills as well. I’m not so sure any more. Lucho Romero leading “Judgment Call”, a seldom climbed route between “The Advocate” and “Dan and the Devil”. 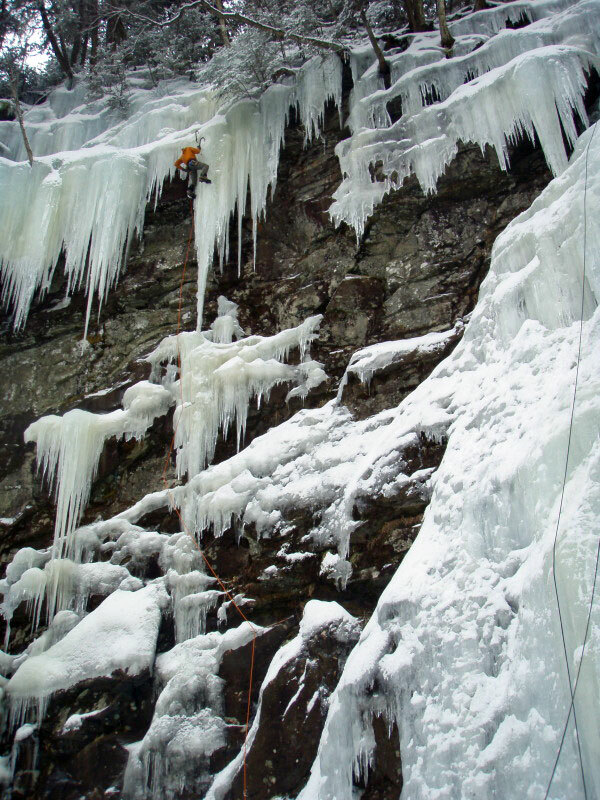 I began coming to the Catskills to ice climb in 2004, while I was still living in Vermont. 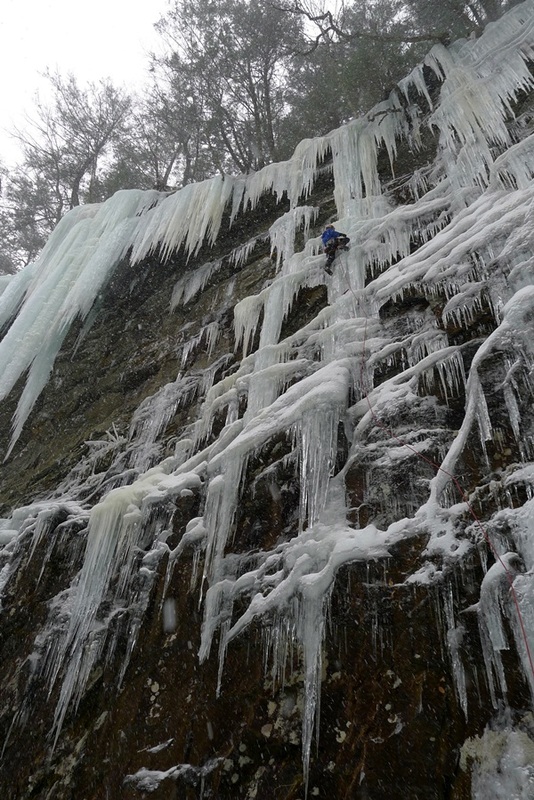 During the previous two winters I’d spent nearly all of my free time climbing ice at Lake Willoughby. I’d climbed most of the classic routes there and felt really comfortable leading steep ice. During my first ride through the Catskills I was impressed by how much steep ice there was. None of the pitches were long, but most of the pillars were dead vertical, leaving the leader feeling like they were climbing overhanging terrain the whole time. 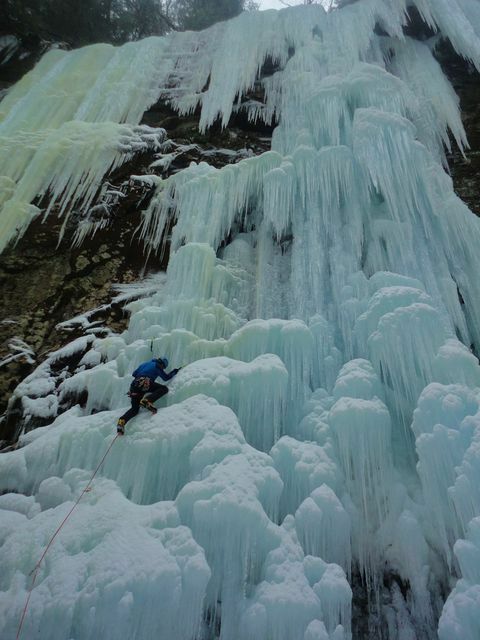 Jason Hurwitz on the sustained vertical ice of “The Advocate”, WI5+. By 2005 I’d moved to New Paltz. I set about leading many of the steep classic ice lines during that very warm winter, when most routes were quite lean. Everything in the Catskills was new to me, and I was blown away by all of the climbing hidden in the steep, wooded hillsides, obscured from view by enormous hemlock trees. Still though, I missed the long, sustained cruxes found at places like Lake Willoughby. Of all the Catskills areas I climbed at that winter, one area stands out above the rest. That venue is the Devil’s Kitchen (aka the Black Chasm). The Kitchen is a cool place. Take the crux pitches from half a dozen Willoughby routes and place them side by side in a deep, shady, backcountry Catskill ravine and you have the Kitchen. 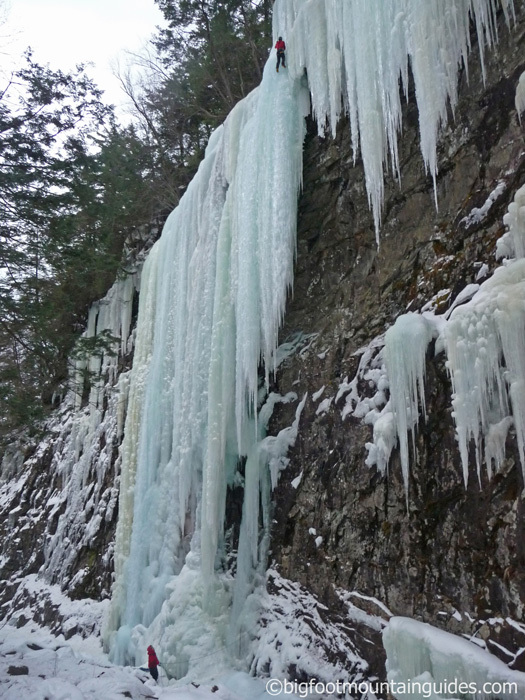 It’s easily one of the best single-pitch training grounds for hard ice climbing on the east coast. It’s also the only spot in the Catskills where you can chew your tongue off on a long, challenging pitch of ice. I’ve climbed there many times since the winter of 2004-2005, and every trip impresses me more than the last. Many locals wait several seasons before working up the gumption to lead routes in the Kitchen. Lots of folks walk down the steep hill, stand beneath the intimidating pillars and promptly turn around. Toproping in the sunnier Hell Hole seems like a better idea to them. The Catskill ice guidebook doesn’t really do this very classic and understated place the justice it deserves. All of the routes are given a WI4+ or WI5 rating, with the exception of the few free-standing pillars like Devil Dog, which are rated WI5+. Having climbed many of the northeast’s hard classics, I can confirm that the guidebook grades are incorrect. Here is my “local’s” synopsis of this very amazing Catskill climbing venue and it’s outstanding routes. Dan and the Devil, the leftmost distinct route climbs 40′ of scary thin 80-degree ice before gaining a short, overhanging, free-standing pillar. This might be the hardest WI4+ on earth (with the exception of Crazy Diamond at the Lake). Classic routes like Repentence, Positive Thinking, and The Black Dike, which are often called WI5- are all technically easier than this route. Judgment Call, a seldom climbed hard route, links patches of ice between Dan and the Devil and The Advocate. Following this route to the top usually requires surmounting an ice overhang on brittle ice near the top. WI5+ usually feels like an understatement on this hard route. The Advocate, WI5, a tannin-stained and intimidating 100′ tall dead-vertical pillar is easily as long as the vertical cruxes on routes like Called on Account of Rains and The Promenade, which are typically rated WI5+. Mephisto Waltz promises engaging and unique climbing. Photo courtesy of Doug Ferguson. Mephisto Waltz, WI4+/WI5, is a spectacular route that almost always forms with some sort of ice roof and climbs overhanging ice mushrooms for 50′ before gaining a vertical runnel. Expect funky “WI6-ish” ice on this one. Hydropower, M9- WI5, established a few years ago, stands as the hardest mixed line in the Catskills and is one of only a handful of routes M9 or harder in the northeast. 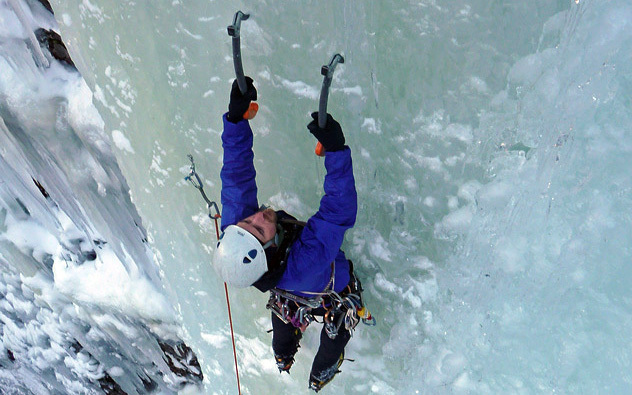 A long pitch of overhanging mixed climbing reaches an arm-busting crescendo just before the ice. From there a short section of WI5 tests your commitment. 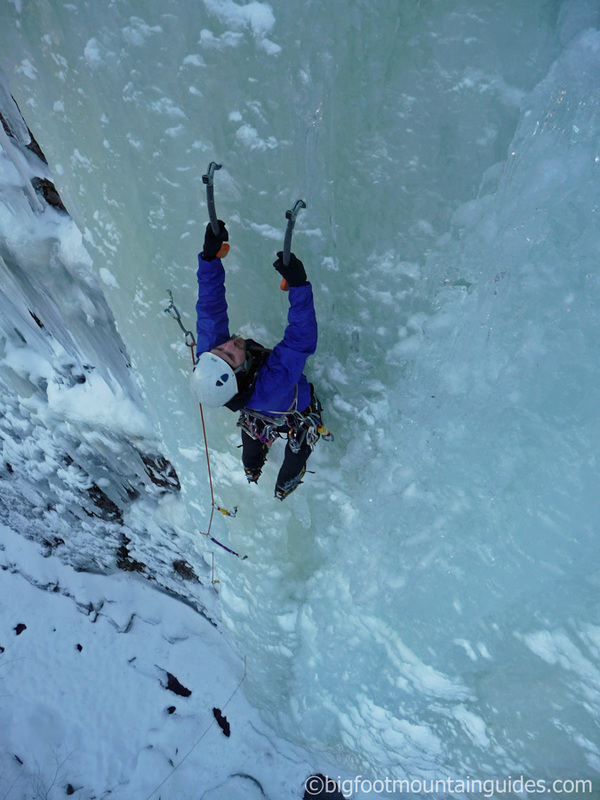 Matt McCormick gains the ice on “Hydropower” during the first ascent. Devil Dog, which almost always collapses under it’s own weight, is a 100′ tall free-standing pillar. I don’t think there’s another pillar like it anywhere else in the northeast. When it touches down think WI6. If it’s candled and hard to protect you might have to wrap your brain around WI6+. Most of the time it’s laying on the ground at the base of the cliff. Instant Karma, one of the finest routes in the northeast, is completely underrated at WI5. 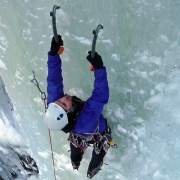 Bolt-protected mixed and thin ice climbing gives way to challenging overhanging bulges and a thin creaky pillar at the top. During lean conditions, which is most years, you’ll have to chimney behind the final pillar and carefully climb onto it’s front near the top. Each crux on Instant Karma is short, but demands one’s utmost attention. Many climbers are intimidated by this route and some wait their whole ice climbing career before leading it. Of all these routes, Instant Karma is my favorite. I’ve climbed it as a perfect cylindrical 3′-wide 100′-tall vertical pillar with good rests and soft ice, and I’ve climbed it several times when it’s lean and I felt like the top pillar, which was only 3” thick at it’s base, might collapse with me on it. To me, this route epitomizes hard Catskill climbing. 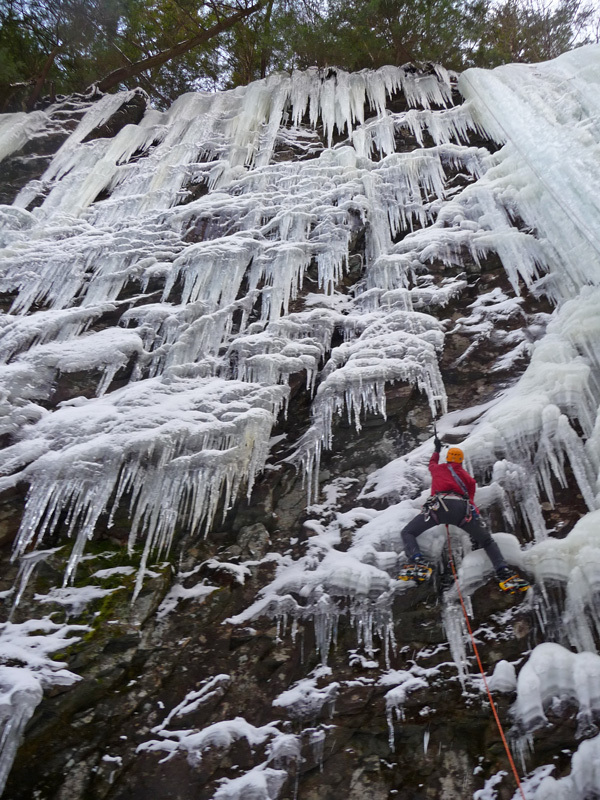 If you swing too much down low on the route there won’t be enough ice left to climb. If you don’t manage rope drag you might pull yourself off on the brittle upper pillar. Swing too hard up top and the pillar just might fall off and cut your rope in the process. Nowadays, many of the routes have bolts to protect the unprotectable sections of ice. They’d all been climbed with traditional protection though, a proposition that seems unfathomable to all but the best ice climbers. It’s good not to forget this when climbing in the Kitchen – local hardmen have been climbing here forever. Isn’t it time you paid this dark, shady place a visit? In a land full of 100′ tall vertical “WI5” pillars, does the mythical northeastern WI6 exist? It’s clear I’ve made my decision – go see for yourself and decide. Excellent piece! Thanks for sharing.. very enjoyable read and great photos. Hey Ryan, Really enjoyed your insight in this article. It seems that the big multi-pitch routes are more likely to get the 5 or 5+ rating than many one pitch dead vertical climbs. Moore’s Bridge is another good example, where those columns in the center are full-on 5 and sometimes they are candled and I would say are 5+ and are much harder than Glass Menagerie or Extensive Homology because at least on those you can stem. Also in the Daks the Pitchoff Quarry I think gets 4 or 4+ which might apply to only the easiest lines in there. Take the upper crux pitches on Power Play or PT and put them on the ground and they would probably get rated 4+. As far as grade 6 goes I would say that pillar in the Hell Hole on the side you and Chris developed is easily grade 6, though I don’t think it’s been in for a few seasons. Also Death Pillar, though off limits in Minnewaska, is solid 6 as well. Climbing in NY for my third season back and forth from home in southwest Colorado. Did Bridal Veil Falls in Telluride a month ago and the crux section (which was solid 6) looked a whole lot like your pic of The Advocate. Have been going to the Dacks but only to Stony Clove in the Cats; have to get to the Kitchen – thanks for the article!